My hometown has a bit of a reputation as a wild place, but not in the “supportive of exotic wildlife” sense, if you know what I mean. Yet an abundance of avifauna thrive here, including one species of the family Psittacidae. For those of you unfamiliar with ornithological taxonomy, that is a parrot! Yes, parrots may be found in the Bronx. In fact, one large colony is fully entrenched in one of our public parks. These birds are Monk Parakeets (Myiopsitta monachus). Though native to subtropical and temperate South America, these hardy invasives have, thanks to the pet trade, established footholds in cities and agricultural communities across the United States. So successful is the monk parakeet that it is actually accepted as an ABA Checklist species, at least here in New York. We’ve been waiting for an opportune time to add these beauties to the Core Team life list and this tedious period when fall migration has ended and winter rarities have yet to appear is particularly propitious for such an excursion. So, we finally made our pilgrimage to visit the wild parrots of the Bronx. This trip wasn’t as easy to accomplish as it may sound. First, we had to find the parrots. The popular parrots in NYC nest crosstown in Brooklyn, while the Bronx birds keep a low profile. Thanks to Steve of BrooklynParrots.com whose site is worth a very long visit. Steve has got the monks of the five boroughs wired, though he does refer to them as Quaker parakeets or parrots (he’s far from the only one.) He graciously sent us across the Bronx to the enormous Pelham Bay Park. Crossing the Bronx is an adventure in itself. To make matters worse, I have an inexplicable inability to remember my way around the east Bronx which manifested itself with a vengeance that day. When we finally did find our target site, right where Steve said it would be, parking was nigh impossible. But my determination to avoid a trip to Brooklyn was great enough to overcome all obstacles. We found the park, then found the described baseball diamond, and at last beheld a thriving colony of Bronx parrots! Actually, what we first noticed were the massive clusters of sticks enshrouding each light platform. 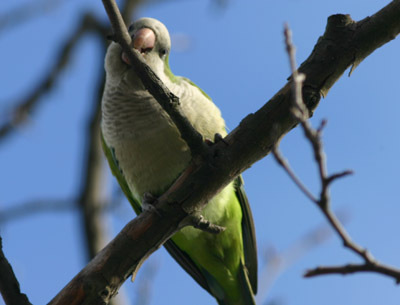 The monk parakeet is the only parrot in the world that builds its own nests and enormous ones at that, a habit that recently got this species in quite a bit of trouble in Connecticut. But once we spotted the nests, we took note of the parrots’ raucous cries. Parrots are appallingly unmusical birds, as hard on the ears as they are easy on the eyes. But once they started coming into view, their noisy shrieks were forgotten. Monk parakeets are breathtakingly green with pale gray below, rich blue primaries, and long, tapering tails. We saw at least twenty of these psittaformes, some at a fairly close range. Another benefit of the trip was the amazing playground in the parrot’s territory, one that Mason enjoyed immensely. So, each member of the Core Team was well-satisfied by our parrot pilgrimage. Best of all, we didn’t have to go to Brooklyn! There are also a lot of Quakers (or Monks) here in the Morris Park area of the Bronx. I see them and hear them all the time. Last summer I counted 12 pearched in one tree on Haight Ave. near Loretto Park! Hey Guys, Just wanted to let you know that the beautiful Quaker parrots in Whitestone NY were evicted today from Con Edison…The company they used was Hawkeye from Hauppauge NY…On the coldest day in January! What will they do to survive in this bitter cold tonight! Why wasn’t a rescue organization called first? 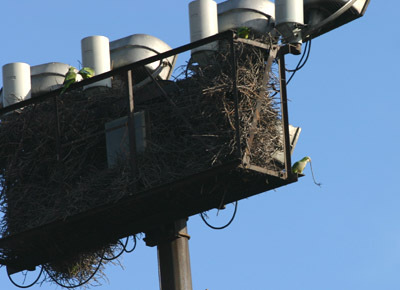 I understand that they can cause a safety factor building their nests on the transformers and poles. Just wondering why they couldn’t wait until the warmer weather or was this a calculated plan for Con Edison to be Rid of the problem???? We called 311, the ASPCA, DEP, CBS and ABC to get the news out and for some answers…Don’t know what else to do…. I hope they survive…..
hey debra…until you have a nest right outside your own home or where you live (directly) ~ you wouldn’t go on about how they should survive. homes on top of the large metal beams above the amtrak train rails on Sacket Ave. Very easy to spot. Just follow your ears! I hate that the nest were removed! I saw about 20 green parrots today in Soundview Park in the Bronx. They are also in vyse snd home street. I see them everyday around 1pm.